The Graphic is a great story of a safer, cleaner, quieter, faster, more sustainable way to build. With a forward-thinking developer in Berkeley Investments, a savvy architect in ICON, and a great fabricator in RCM, the team is more than 50% finished stacking boxes. Tocci has progressively developed its modular expertise over two decades. 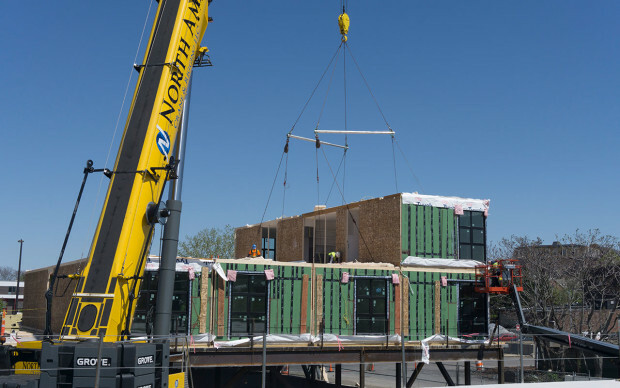 Its first modular project, the VNA Senior Living in Somerville, was a 86,300 square foot, 96-unit senior living building completed in 2000. 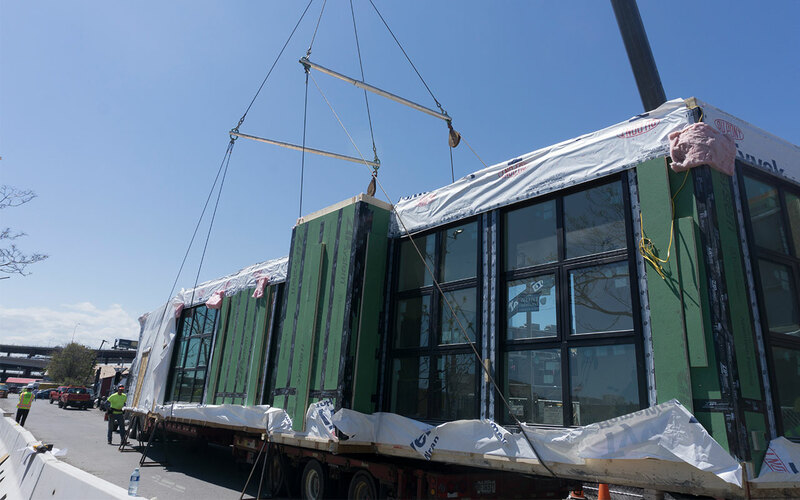 Tocci then finished Park87, a 73,400 sf building in Cambridge, constructed of 75 modular boxes to create 54 residential units. Tocci went on to build Chelsea Place, an 80,000 sf residential building consisting of 70 modular units set on a structural steel and concrete parking podium. 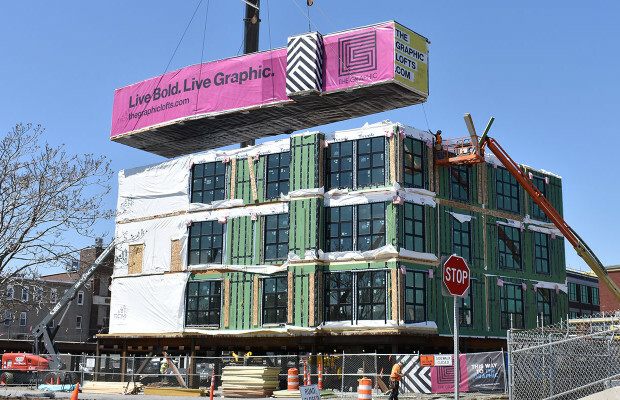 The lessons learned from these projects are enabling the company to partner with a great developer, architect and fabricator to build the largest modular project in Boston. The modular component of The Graphic is four stories of multifamily housing on a steel and concrete podium with a parking garage beneath. 125 units, amenity spaces, and corridors are fabricated by RCM. Throughout the last three weeks, these modular boxes have been trucked to Charlestown and are now being stacked. The team is averaging about fourteen boxes per-day. 125 units, amenity spaces, and corridors are fabricated by RCM. Two specialized 18-wheelers shuttle each box from the factory to our staging site. The experienced crew lifts the box into place with a crane while workers in lifts guide them to their destination. On a daily basis we lift up to fourteen 34,000 lbs. 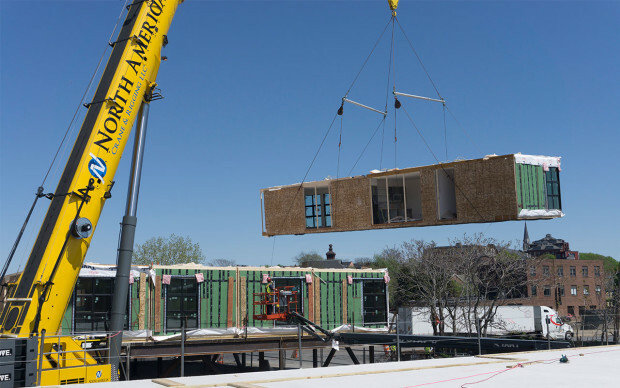 boxes with a 400-ton crane and delicately lay them into place. 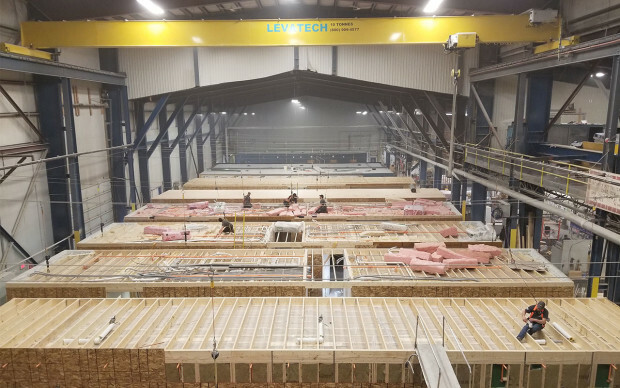 Structural connections are made to secure them in place, and then next boxes are ready to fly. 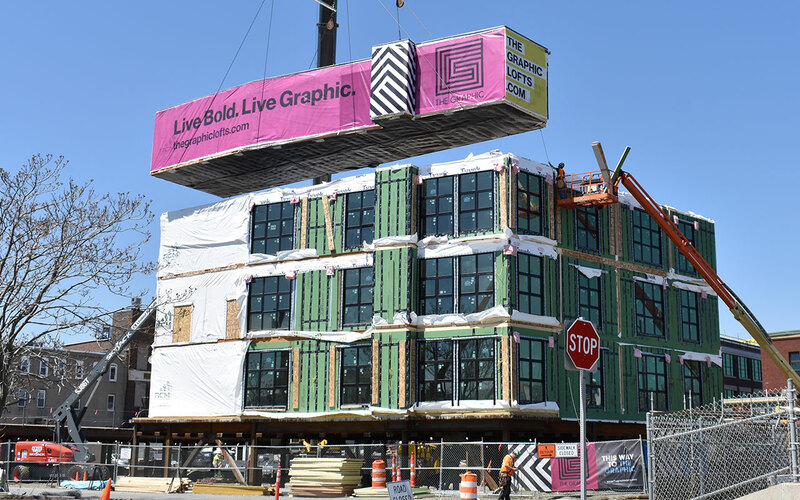 Moving forward, the Graphic’s team and its subcontractors button up the modules, make inter-box connections, and complete the building finishes. Many boxes contain a unit, a corridor, and then part of a unit of the other side. The flexibility to this set-up is a great asset – it allows for multi-bedrooms or public areas (like a fitness center). 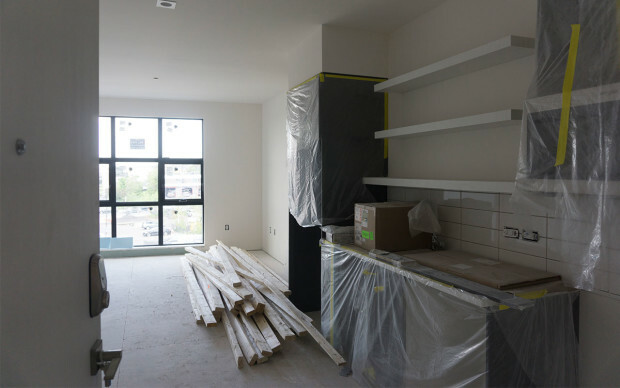 Boxes come complete with drywall, cabinets, rough MEPs, lighting, showers, and even tile flooring. Local residents are amazed by the swiftness of the operation, noting they drove by in the evening to see a building that wasn’t there that morning. That’s the true beauty of modular. Less noise, less disruption, increased quality, increased speed.